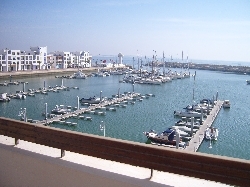 Welcome to our selection of holiday homes to rent in Morocco. Morocco, officially titled the Kingdom Of Morocco, is an African country, which appears as a long, thin strip along the north west coast. It is bordered by the Atlantic Ocean to the north, the Western Sahara to the southwest and Algeria to the southeast. The stretch of water between Morocco and Spain to the north, known as the Strait Of Gibraltar, is very narrow and as a result many districts along this coast are Spanish-controlled. The climate in Morocco varies dramatically according to time of year, elevation, proximity to the coast and even between night and day. The seasons in relation to the calendar are very similar to those in Britain, with summer between June and September and winter between December and March. Average summer temperatures range from 18 to 28 degrees C by the coast and up to 35 degrees C inland. For comfortable temperatures a British tourist should consider either summer by the coast or winter inland. Be prepared for sharp drops in temperature when night falls. Because of its long, thin shape Morocco has a very long coastline in relation to its size. The Atlantic coast is notably cooler than the Mediterranean coast, but both are well provided with the usual water-related activities and accommodation. 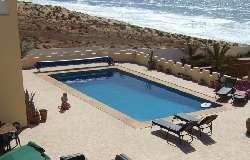 Looking for self catering holiday accommodation in Morocco? Then below is a selection of villas in Morocco and apartments in Morocco that can be rented direct from their owners. You can either click on each listing for further details or you can use our search engine on the left if you are looking for something in particular.